U of T Engineering students at the 2013 Ontario Engineering Competition. View more photos in Flickr. 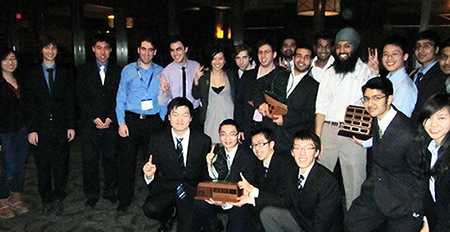 U of T Engineering students excelled at this year’s Ontario Engineering Competition (OEC). They took home awards in five of the six competition categories, including three first-place wins. The winners will advance to the Canadian Engineering Competition in Ottawa for a chance to enter the inaugural International Engineering Competition. The number of U of T students qualified to compete in this year’s OEC is unprecedented in recent history. 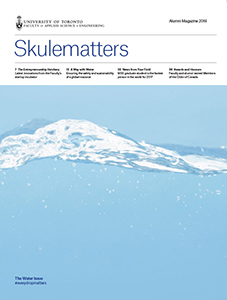 Competitors were selected by Skule alumni judges at the student-led University of Toronto Engineering Kompetition (UTEK) prior to the OEC on January 26. Now in its 34th year, the OEC gathers top engineering students from schools across Ontario. Judged and organized by leading engineering professionals and professors, the event provides a chance for students to develop their skills and impress their peers.